Take a look at this cute diaper cake! It has such cute colors and a really fun diaper cake topper. Lori submitted this adorable cake and it was her very first one! We are so glad she submitted it to share with everyone. Thanks Lori!! I made this diaper cake for my sons girlfriend. The first one I have ever made. I'm proud of myself.. 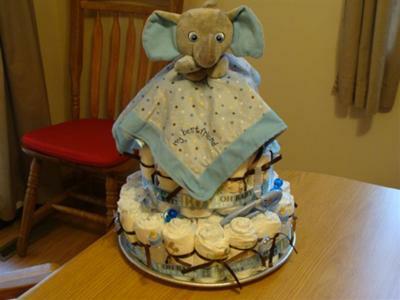 I love this diaper cake you made, I'v been looking for an animal themed cake w/ou over doing it and this is perfect!! You need to start your own business...! LOL..... How did you do start it and could you give instructions?